Continuing on from the last article in this series on color, Red, Yellow, and Blue, or CMYK, we’re now going to take an in-depth look at color schemes — lots of examples to follow. When we talked about the value of color earlier, we talked about tints and shades. A monochromatic color scheme—like the one shown in Figure 1, “A monochromatic monkey”—consists of a single base color and any number of tints or shades of that color. Hot pink is a super-saturated color that packs a powerful punch when paired with black and white. 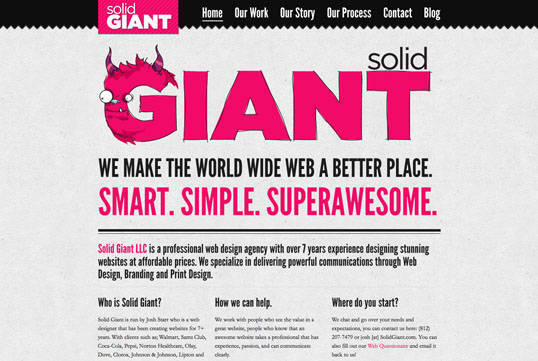 This is obviously what Indiana-based web agency Solid Giant was going for with the monochromatic color scheme you see in Figure 2, “The Solid Giant website contrasts color effectively”. 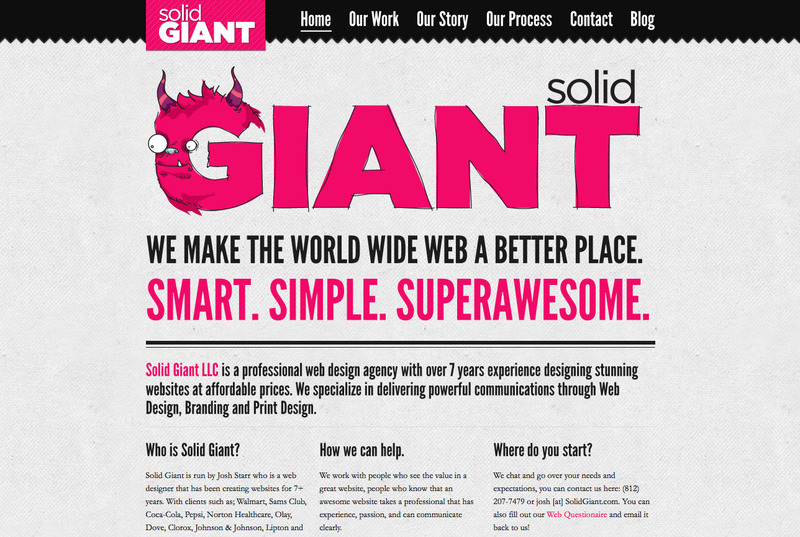 Each section of this single-page, scrolling site alternates between a textured white background and a pink one that’s as bright as the “superawesome” copy on the home page. 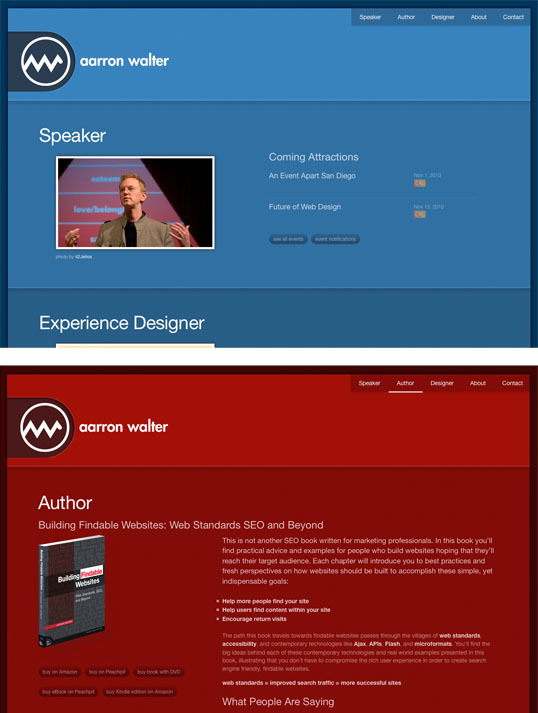 Many websites use different color schemes for each section of content. This approach can add richness and character to the content, but may also produce some identity issues. 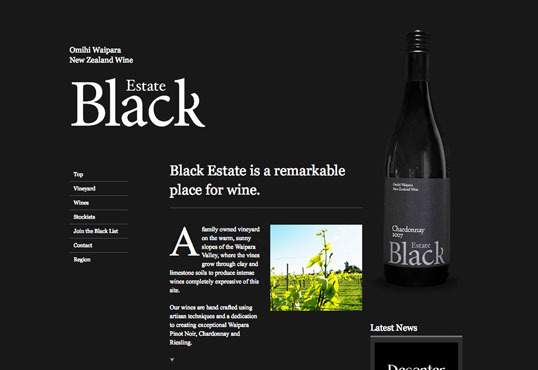 If you’re going to use multiple color schemes within a single site, be sure to keep the logo, menu, and overall layout of the site consistent to avoid confusion. Art in My Coffee is a Tumblr blog created by Jina Bolton and designed by Meagan Fisher, which catalogs latte art from all around the world. It’s no surprise, then, that the site features a monochromatic color scheme based around creamy tints of tasty brown coffee, as you can see in Figure 4, “Art in My Coffee—featuring colors directly drawn from the site’s subject matter”. If you know that the photos and content of your site will feature lots of the same color, it’s a terrific idea to follow Meagan’s lead and design your color scheme around the content. The site for New Zealand’s Black Estate Vineyard in Figure 5, “Black Estate wines—living up to its name” features a special breed of monochromaticism. Yes, I just made that word up. Any set of colors that consists solely of black, white, and shades of gray is known as an achromatic color scheme. The word achromatic literally means “without color.” Just because the overall scheme of the site has no color, it doesn’t mean the content has to be colorless as well. Because of the dark background, ample use of “white” space, and lack of surrounding color, the vibrant photographs pop off the page, giving life and light to the design. An analogous color scheme consists of colors that are adjacent to one another on the color wheel. If our color wheel were a delicious pie (mmm, pie! ), then an analogous color scheme would be a fairly large slice. The key to creating a good analogous scheme is to remember that your eyes are bigger than your appetite. As a rule of thumb, avoid having a slice that’s bigger than one-third of the whole, or you’re bound to make users sick. 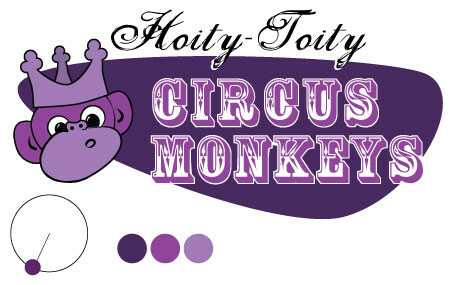 Returning to our hoity-toity monkeys in the design shown in Figure 6, “An analogous monkey”, we’ve taken their regal purple and warmed it up with some orange tones. The playful illustrations on the home page for Forrst deepen the metaphor of this designer/developer community. 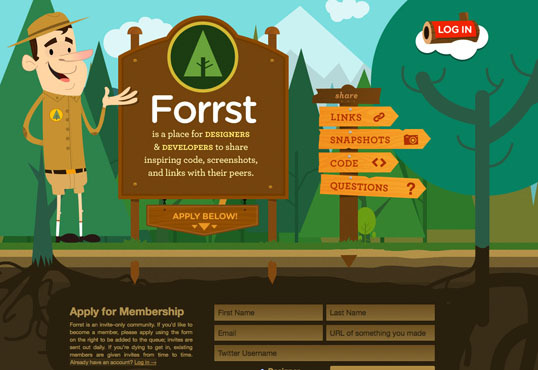 While you’re snickering at the park ranger’s SpongeBob-like legs or the “Log In” pun in Figure 7, “Lost in the Forrst”, note the rich analogous color scheme. From the teal sky to the orangey browns, the colors of this design are contained within a one-third wedge of our color wheel pie. 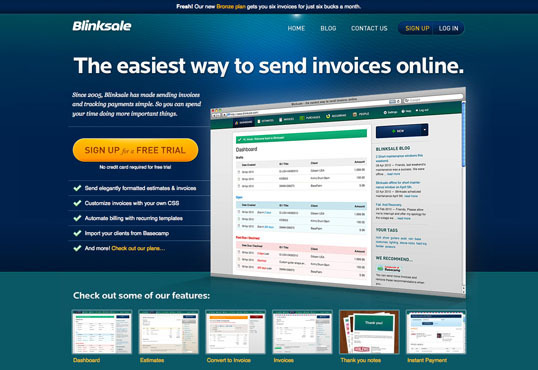 Blinksale, shown in Figure 8, “Blinksale’s site is professional without being staid”, is a hosted web application that creates, manages, and sends CSS-formatted and plain-text invoices. 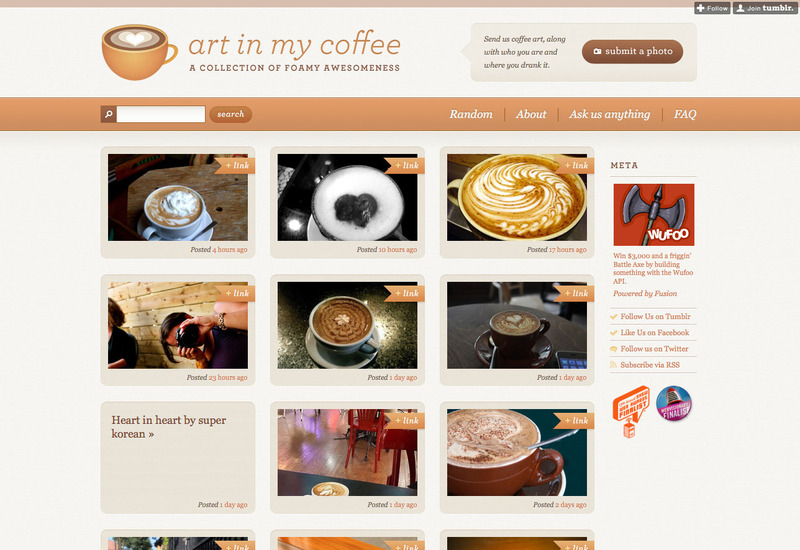 It’s also an excellent example of what a creative analogous color scheme can do for a business website. 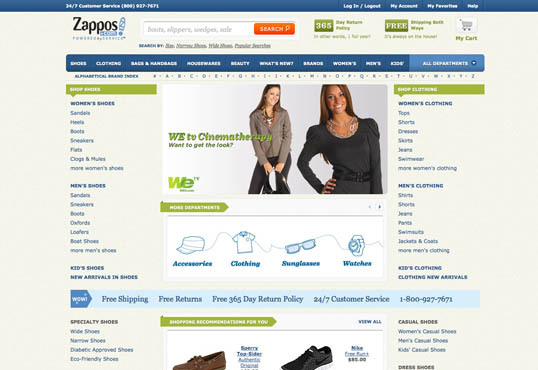 It crumples up those preconceived notions of how corporate websites should look, and tosses them into a cool sea of colors ranging from blue-green to yellow. Be sure to note how color contrast makes their call to action the first thing you see. The perspective lines of the screenshot on the right also take advantage of continuance, constantly guiding your eyes back toward that sign-up button. While Blinksale’s home page is designed to dazzle and amaze, the Zappos home page (Figure 9, “Zappos gets down to business”) gets straight down to business. This is achieved by relying on a solid analogous color scheme of blues and greens. The brightly colored search button at the top of the page stands out because it introduces a completely different hue from the rest of the site. One might even say it complements the blues on the page … but what does that mean? Read on to find out. 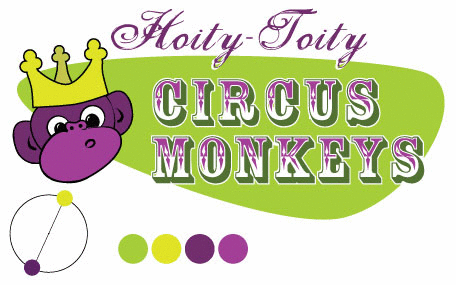 Complementary color schemes like the one featured in our updated hoity-toity illustration—shown in Figure 10, “A funky complementary monkey”—consist of colors that are located opposite each other on the color wheel. Placing red-violet and yellow-green together is uncommon, but the monkeys insisted that I keep some of their royal purple in the picture. Sheesh … these clients are a bunch of primates. 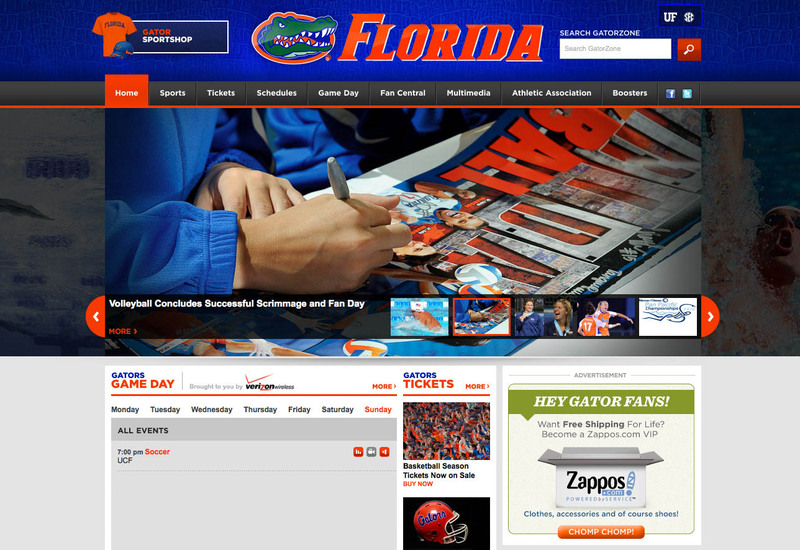 The University of Florida is my wife’s undergraduate alma mater, and the school’s orange and blue team colors provide a strong foundation for a complementary color scheme. Some people may be put off by the stark contrast of complementary color schemes found on its athletics website (seen in Figure 11, “The University of Florida Athletics website uses bold complementary colors”), but when the colors represent the business or entity for which you’re designing, you can’t go wrong. 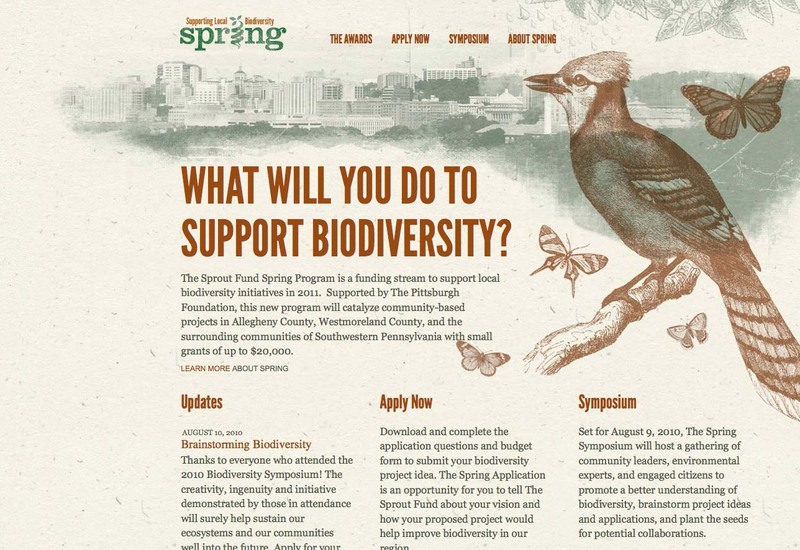 Pittsburgh’s Sprout Fund Spring Program website in Figure 12, “The Sprout Fund Spring Program uses complementary colors to a more organic effect” proves that complementary color schemes don’t have to be as bold as UF’s orange and blue. By toning down the saturation, this red and green design looks very natural and earthy, helping support the message of biodiversity. The beautiful illustrations and artistic textures really make this design sing. 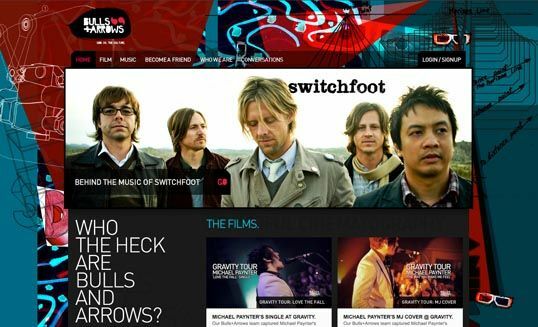 I’m really unsure why so many musicians insist on having all-Flash websites, and then never update them—but I digress. Regardless of the publishing platform, the website for musician Zach Hendricks is a beautiful textbook example of a complementary color scheme, as you can see in Figure 13, “Zach Hendricks: a textbook example of complementary colors”. 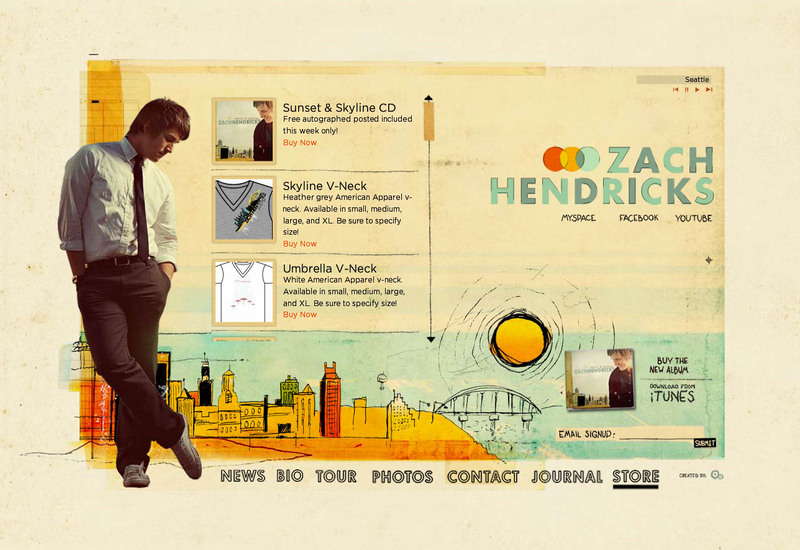 It’s impossible to choose complementary colors without pairing cool with warm, and the designers of this site were well aware of that. The city skyline and bright round sun glow hot against the cool teal water. If you wanted to experiment with this exact color scheme, the secret formula is right there in the overlapping circles of the logo. To this site’s credit, there’s a non-Flash fallback for those of us trying to access it via iPhone or iPad. Since complementary colors are so different from each other in many ways, they can cause an effect known as simultaneous contrast when placed together: this is when each color makes the other appear more vibrant and dominant. This is actually what makes complementary color schemes so successful at moving visitors’ eyes around a composition. However, it can be horribly painful when complementary colors are used in a foreground–background relationship, as they are in Figure 14, “Beware of simultaneous contrast!”. Another common pitfall is to choose colors that aren’t directly opposite one another on the color wheel, yet aren’t close enough to be analogous colors. These combinations are known as discordants because the colors will often clash with one another, causing viewer discord. In fact, 1980s fashion was all about discordant colors. 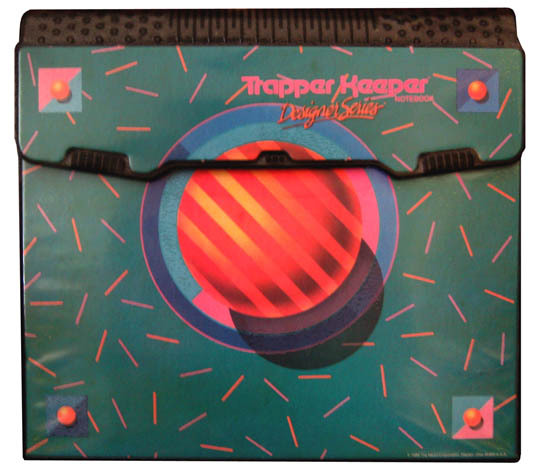 Seeing a discordant color scheme these days tends to bring back fond memories of that geometric “designer series” of Trapper Keeper binders I loved so dearly at school—one’s depicted in Figure 15, “A discordant Trapper Keeper cover”. As this example shows, this pitfall can be made workable if it’s used intentionally. Discordant colors are whizbang combinations that really appeal to children, teens, and tweens, so using them for youth-oriented sites or products is worth considering. They can also be used sparingly in more grown-up designs to create greater emphasis than can be achieved with just a simple complementary combination. For an example of this type of color scheme, check out Bulls+Arrows in Figure 16, “The Bulls+Arrows site makes great use of colors that clash”. The site features several randomly loading background images, each with a color scheme of its own. This particular image pairs bright red with a blue-green that’s just far enough from complementary to give this design an edgy look. Split-complementary, triadic, and tetradic color schemes sound technical, but they’re just simple variations of a basic complementary color scheme. To create a split-complementary color scheme, use the two colors adjacent to your base color’s complement. For example, take the left-most color scheme shown in Figure 17, “Split-complementary color scheme examples”. Red is the base color here, so instead of using green to form a complementary scheme, we’ll use the two colors adjacent to green, chartreuse (yellow-green) and aquamarine (blue-green), to form a three-color split-complementary scheme. Note that, since you’re using your base color with two discordant colors, this type of color scheme can look juvenile and extreme, but that may be just the effect you want. For a triadic color scheme, we just push our split-complements out one more notch on each side, so that all the colors are equally spaced on the color wheel. Starting with red as our base color again, we select yellow rather than chartreuse, and instead of aquamarine, we select blue. This divides the color wheel into thirds, hence the tri prefix in triadic. In this example, which is the left-most scheme in Figure 18, “Triadic color scheme examples”, we have the three primaries (red, yellow, and blue) making up our color scheme. If you turned the scheme clockwise one notch, you’d have chartreuse (yellow-green), violet (blue-purple), and vermilion (red-orange), as shown in the middle example in Figure 18, “Triadic color scheme examples”. Knowing that triadic color schemes involve three colors, you have probably deduced from your extensive knowledge of the Greek language (okay, so maybe you haven’t) that a tetradic color scheme involves four colors. A tetradic color scheme combines any complementary color scheme with another complementary color scheme. The left-most example in Figure 19, “Tetradic color scheme examples” is a tetradic color scheme that combines orange and blue with yellow and purple. 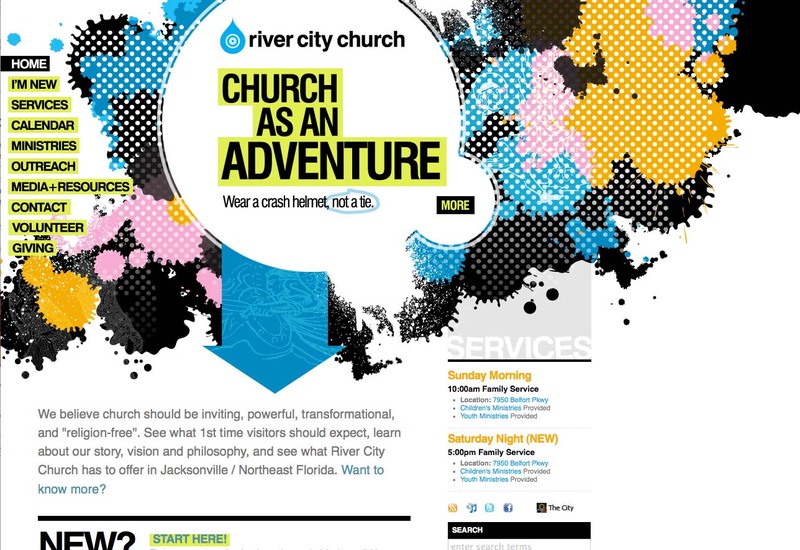 The website for River City Church in Jacksonville, Florida (shown in Figure 20, “The adventurous River City Church”) is an excellent example of a tetradic color scheme. Notice that there are exactly four colors in this design besides black and white. We have the complements orange and blue, paired with pink and green. Finding pure examples of the six classic color schemes I’ve described above is a difficult task. That’s because sometimes designers make one up from scratch, or it’s because they use a slight variation on one of these themes. In the section “Other Variants” below, we’ll discuss a few options. Monochromatic with mo’ pop — Rather than just using tints and shades of your base color, try incorporating pure gray, black, and white. This will create more contrast, and more “pop” within a monochromatic color scheme. Analo-adjust — Adjust the saturation of one of the colors in your monochromatic scheme up and adjust the others down. A highly saturated color will stand out when placed among muted colors. There should be no analo-guessing which one is the saturated color. Mono-split-complement — If you have a good thing going with a split-complement color scheme but want to add some depth, try using a few tints and shades of your base color in the design. Obviously, I just made those names up, but you’ll notice that all three variants are similar to the main traditional schemes. It’s easy to tweak the traditional color schemes a little for more character, but remember that the color scheme you choose is the foundation from which you’ll build your website’s color palette. It’s important to build on a firm foundation, or the rest of your design could come tumbling down. Next week we’ll return to a shorter post, looking at color palettes and how to create them; stay tuned.